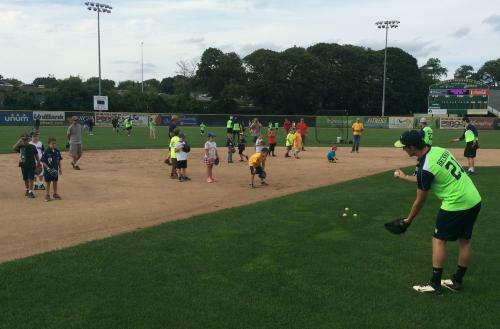 Play baseball with the team this summer at the Worcester Bravehearts baseball camps! Open to boys and girls ages 6 - 12, these week-long camps will be run by the Bravehearts coaching staff in conjunction with the staff of Holy Cross Baseball. 2019 dates are the weeks of July 15 - 19 and July 22 - 26. The camp day runs from 9 AM - 2 PM with drop off available as early as 7:45 AM with our staff. Player instruction begins at 9:00. Lunch is served daily at 11:45 with options changing each day. The fee for the entire week is $300 and $560 for both weeks. Ask about how you can get the early bird rate regardless of when you register by joining the Junior Bravehearts. Bravehearts Baseball Camp registration is open and can be completed simply by filling out the form on this page below (or click here to be taken to the form on a separate page). If you'd prefer to download the form, fill it out, and either mail it or email it to our office, you can do so by clicking the "Download" link below. Medical forms are also available to be downloaded in the packet below. You can also call our office at 508-438-3773 to get more information or sign up your child for the camps.